Hey all! Today we’re focusing all on your windshield wipers. Rainy season is approaching here in Texas and we want to make sure you’re ready to drive safely in potential downpours. We’ve collected tips from a Ford expert and from our very own Barry Beard. Enjoy! Pop hood and search for lid with wiper blades. Fill it up, fill the reservoir with wiper fluid, until it’s almost full. Close the cap and drop the hood. Easy peasy! Installation is also simple. Lock your new blade into where you detached the old blade and you will hear a click. You’re good to go! 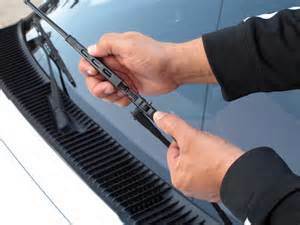 But how to know when it’s time to change your wiper blades? We talked to our own Barry Beard on this one. He let us know that the wear indicators on our wiper blades are great at informing on when you’ll need to switch. They’ll turn from black to yellow when they need to be changed. Black means you’re in the clear. Yellow means time to switch! Barry also adds that we should check for dry rot on our wiper blades. This dry rot can cause scratches on the windshield, so always make sure your rubber is in tact. If you have any questions or simply don’t have time to do these tasks, the crew at Leif Johnson Ford is always more than willing to help! Call us today at 512-454-3711 to schedule a service appointment today!